Magic Minutes is helping organisations change the way they work by bringing greater focus and accountability to every meeting. Improve visibility of your upcoming and recent meetings in one easy-to-manage list. You can search for a meeting or attendee to quickly find what you’re looking for. Managing your meetings has never been this easy! If you pick up actions or tasks from your meetings, these are displayed in a simple list so you can stay on top of your commitments and get stuff done. Magic Minutes is helping people to run better meetings and change the way they work. 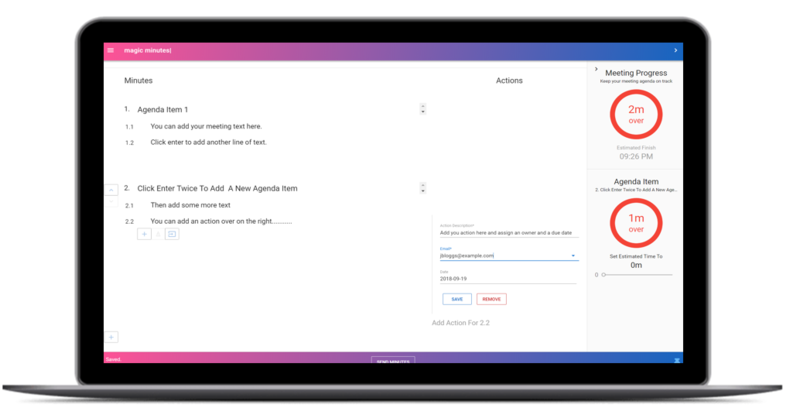 Whether you’re taking official meeting minutes or just need to capture some notes, Magic Minutes has the power and the flexibility to take your meetings to the next level. Create agendas on-the-go or set one up beforehand to ensure that your meetings stay focused. Actions and tasks can be created at the push of a button (literally just press “@”). You can easily assign an owner, add a description and set a due date. You can also add and view comments so that you can keep track of progress (and excuses!). You can add images or screenshots into your minutes to help illustrate a point or capture the output of a whiteboard session. At the end of the meeting, the minutes and actions can be sent out via email or viewed in the dashboard. 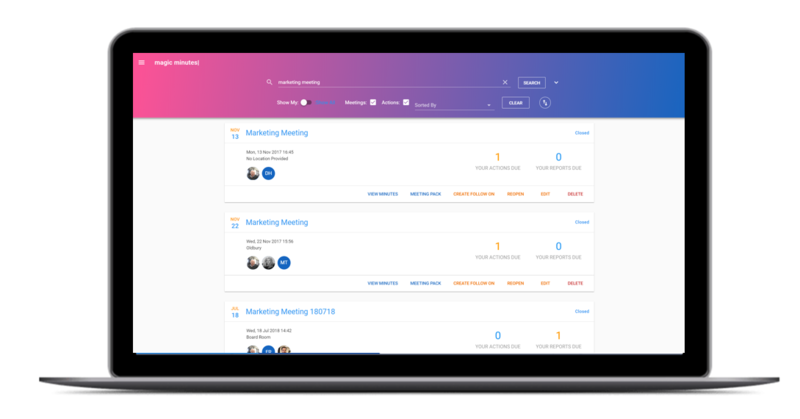 You can even set up a follow-on meeting at the push of a button and Magic Minutes will do the hard work of creating the agenda, inviting attendees and requesting reports! Have you ever been in a meeting that was a waste of time? 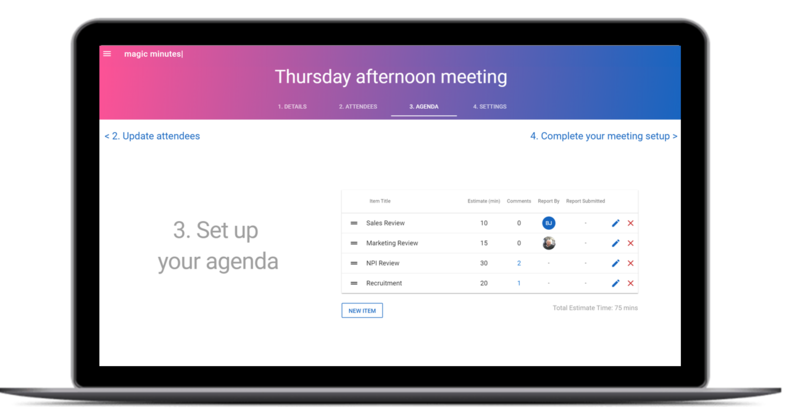 We have, so we built some software to make your meetings better. Capture the discussion then email the minutes and actions at the push of a button. Automatically send progress reminders to get updates on actions. Run a ‘Follow On Meeting’ and previous actions are included ready for review. Circulate agendas and upload reports before the meeting to ensure all attendees come well prepared. 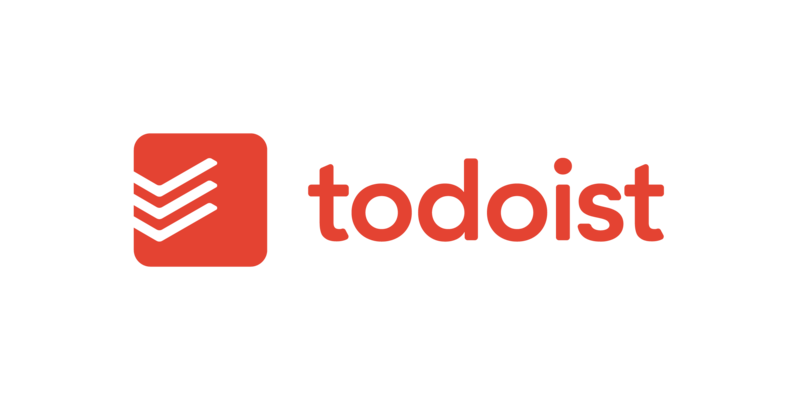 See all your meetings and actions in one place to get the full picture. Yes. We want you to be able to use all of the core functionality of Magic Minutes for free. You can organise unlimited meetings free of charge. If you need to customise your minutes with your own logo or use the other premium features then you can upgrade to a paid plan. Why not just use Word or Google Docs? If you switch to using online software for your minutes you won’t look back. 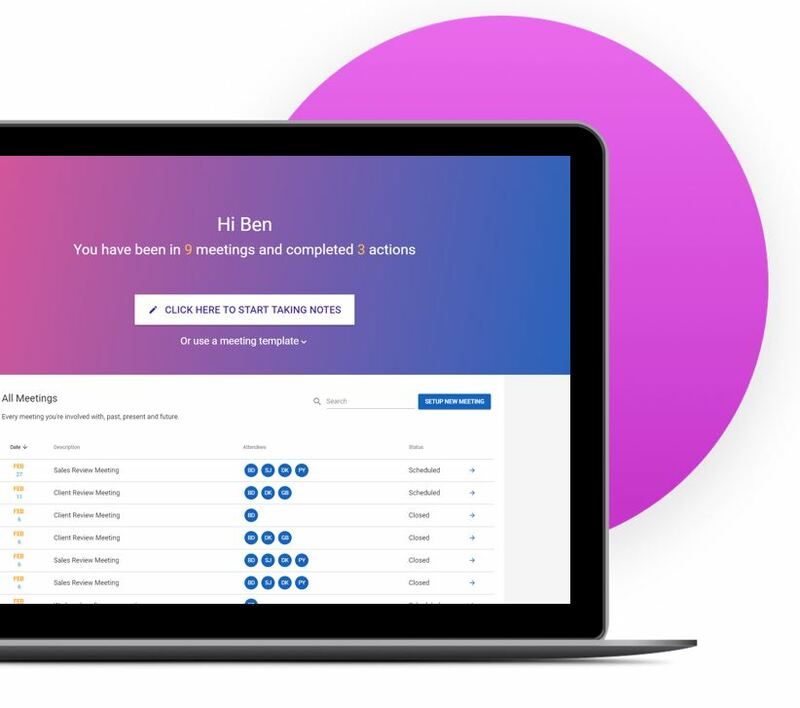 Minutes and actions can be emailed out instantly if you want, progress on actions can be recorded and all follow-on meetings automatically bring previous actions in for review. You will be more organised, look more professional and get more tasks completed. When you upgrade to a paid plan, you can add your own logo to the minutes and use the other premium features like creating meeting packs and chasing action progress automatically. We take data security very seriously as we appreciate the sensitive nature of some meetings. All your meeting data is encrypted and stored on servers in London and Frankfurt. We keep the database on a separate location to the application and restrict access to database via an SHA tunnel. We use industry-leading Auth0 services to manage user log in details. The team behind Magic Minutes have chaired meetings for over 100 organisations ranging from PLCs, Private Equity, SMEs, and Not-for-Profits. 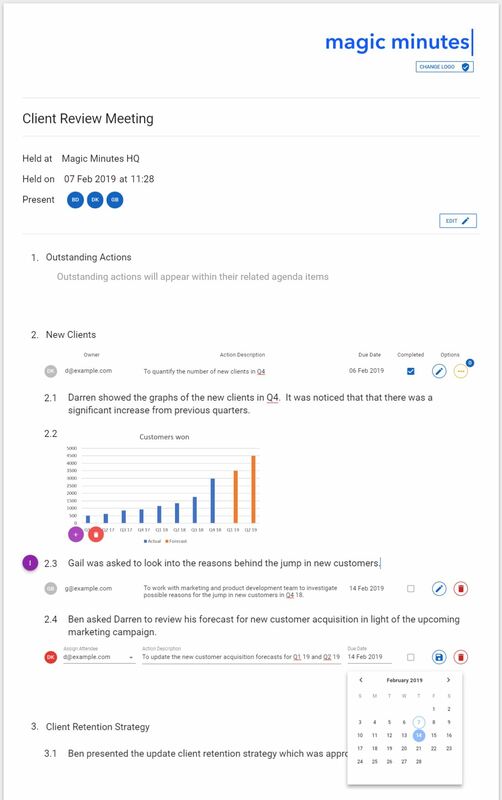 Try Magic Minutes for Free and start changing the way your organisation runs meetings. Magic Minutes was first launched for open access in 2016 at Version 1. In 2017, Version 2 was launched which used a separate database and a completely new User Interface. This needed a different log in to Version 1. In 2018, Version 3 was launched which still accessed the same database as Version 2, but had another major re-write of the user interface and security was moved to Auth0. This means that users had to sign up again with new credentials. The previous versions are no longer supported, and to improve security of anything uploaded these are no longer accessible to the public. We have back ups so if you have data stored in Version 1 which you need to access then please contact us.